You’ll forgive me if this post is a bit picture heavy – this was a project a year in the making. Last year, my dad declared he wanted a winter coat he could wear while traveling to colder climates for work meetings. We don’t have much need for real winter coats here, and, indeed, it is actually very difficult to even find them in stores, unless you are looking for some sporty ski-wear. So my mother and I decided to go in on a birthday coat project – she’d buy the materials and I would sew it. We ordered all the fabrics, and I worked out fitting the pattern, Vogue 8940, but the coat never got made. I wasn’t in love with the wool we’d ordered. It was beautiful, but much too thin. My dad insisted he wanted something lighter-weight, but I also know that he gets very cold, so I kept putting off the construction because I knew it wouldn’t turn out the way either of us wanted. Add to that a growing list of commissioned projects and general busy schedule and exhaustion, and you end up with the UFO lying around your sewing room for the better part of 11 months. Fast forward a year. I’d found some wool on sale that I thought might work, and the need of the coat for an upcoming family visit to New York mid-November kicked my rear into gear. Luckily, the only changes I needed to make to the previous years muslin was a full bicep adjustment, and I was good to go for cutting out and construction. The construction was involved, as coats tend to be, but not overly complex, except perhaps for the inside welt pockets. I ignored Vogue’s instructions for that; they’d failed me in the Sewing Bee, and I wasn’t going to use them again for a project as important as this. Otherwise everything went fairly smoothly; I am glad I made a muslin though, as the shoulder seams are offset, and thus the sleeve placement seems a bit odd at first. Pattern Description: Men’s lined peacoat in two lengths with welt pockets, and men’s pants. I made view B – the longer coat without front detail. Pattern Sizing: Vogue’s men sizes 34-40 and 40-46. I’m pretty sure I started with a 46 and graded out quite a bit in the waist area. Were the instructions easy to follow? I thought the instructions were really good! I did use a YouTube tutorial to change how I did the inside double welt pockets, as my last attempt at double welt pockets using Vogue instructions ended in disaster. I also changed how I sewed in the lining, doing a bit more of it via machine using a partial bagging method, rather than all of the hand sewing that was expected by the instructions. I did hand sew around the vents, but machine sewed the rest of the hems. Did it look like the photo/drawing on the envelope once you were done with it? Yes! Although the wearer is not as svelte as that Vogue model, I think it still looks pretty dapper. What did you particularly like or dislike about this pattern? Likes: This is a very handsome coat, but still feels modern. I like the back yoke and topstitching details. I also love the two piece sleeves. My dad really likes the inside pockets – 4 pockets is a lot of places to put things! He also used the collar button feature when it was super windy, so that was a hit too. Dislikes: Might just be me, but it seemed like the sleeve pattern didn’t quite match up right with the markings on the shell? The lining pieces fit together like a dream, but for the outer shell, I looked at the line drawing, and eyeballed the placement of the back sleeve seam, which should be halfway between the back yoke seam and the back-side seam. When I used that for placement, the sleeve worked out great, but when I tried to match markings the sleeve was awkwardly rotated in the opening. Luckily, I discovered this via the muslin fittings I did, so I only had to set the sleeves once on the real garment. Also, I found the inside double welt pockets a bit tricky because there is a seam that runs through it, making it a bit bulky. Presumably this is a common RTW feature, but just a warning that sewing it takes a fair bit of steam and finesse. Fabric used: Outer shell is a brushed grey wool (90% wool, 10% poly) from Fashion Fabrics Club (sold out). I’m sort of torn between thinking that the fabric looks sort of like a packing blanket and thinking that the colors make it sort of unique. This stuff left fluff and fibers everywhere, but the weight was really nice, and it pressed and sewed like a dream, so it gets points for that. The lining is a stripped acetate from Mood (no longer available), interlined with cotton flannel from Jo-Ann. The orange trim is Bemberg lining from Michael Levine. I also used fusible hair canvas and heavy weight fusible woven interfacing from Fashion Sewing Supply. Pattern alterations or any design changes you made: I actually started on this project a year ago, got as far as the muslin, then abandoned it because spring rolled around before I could finish the coat. I also wasn’t happy with the fabric we had chosen originally; it was much too thin. So, suffice it to say, I don’t quite remember everything I did to alter the pattern, though, I’m pretty sure it wasn’t much. I know I did a full bicep adjustment, and I’m pretty sure I did a full stomach adjustment as well. Plus, I may have graded out the original pattern at the shoulders a bit? I also adjusted where the buttons would go, so that it would close completely. I used a different insertion method for the lining double welt pockets. It turned out much better than my last attempt (wherein I used the Vogue instructions), but I think it could have been neater if I’d not used lining fabric for the lips. It’s quite bulky as the pocket extends across the seam, and the orange Bemberg, even interfaced, wasn’t enough to hold its shape as well as I’d like. As a design feature, I added a strip of orange bias tape between the lining and facing, because my Dad’s college color was orange. I also added a monogram below the inside pocket, because I’m fancy like that. Also, this isn’t so much a design change as an excited announcement that I’ve learned how to use the “Memory” button function on my sewing machine to make perfectly matched extra large button holes. I figured this out last week, but I’m still pumped! Would you sew it again? Would you recommend it to others? I’d definitely sew this again if the time called for it, but I wouldn’t want to sew another anytime soon though. It was quite a project, and I pumped it out in just a week. 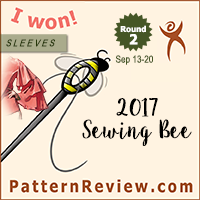 Originally, I’d wanted to make it for the Wool Coat Contest, but after the Bee I was just too exhausted to finish it in time. Then, because I didn’t start right away, I was working on something of a deadline; my dad needed it for a trip to New York, and a trip to Texas the following week. It was definitely cold in New York – the dense wool and flannel interlining were certainly appreciated, though he did say it was a bit heavier than he was used to (that’s what happens when you live in the southwest for over 40 years). 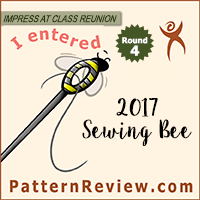 I’d definitely recommend the pattern to others – it’s got lots of great details, and the fit is a perfect blend of classic and modern. I would even consider sewing the shorter version for some of the other men in my life, if they ever needed a peacoat. Doubtful that I’ll ever make the pants, but you never know. Conclusion: On the whole I am fairly pleased with how this turned out. I’ll likely be dusting my sewing room for months to come, I’m not entirely pleased with the double welt pockets on the inside, the hem points could be a bit better, and I wish I’d had time to get the collar roll set a bit more, but overall I think it turned out rather nice. The coat even got several compliments from strangers in New York – pretty impressive considering they would know much more about warm weather clothing than I would. This was a birthday gift a year in the making – literally – so I hope it was worth the wait! Outstanding coat…!! Your dad looks really happy in it! The inside is totally impressive too, and the orange binding is a really nice touch. And nice embroidery! It’s so nice! It really fits him well and he seems happy. Bravo! Wow fantastic job, worth the wait to get it right though I guess you are quite pleased to have this done! I adore the lining details which make it so personal. The little details in this are so great. I love the monogram! What a beautiful coat. Excellent work! Guessing your dad likes it rather a lot too. He is surprised by the weight of it, but he likes the warmth. Love the picture of your Dad in the coat. He looks really pleased.